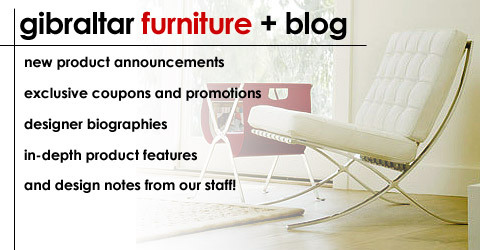 $695 is the price for Le Corbusier Grande chair from www.gibraltarfurniture.com (800 416 3635). Gibraltar is furniture nirvana for classic furniture! Our product is a world class imported classic piece that will be a showcase addition to any collection! This exclusive classic masterpiece is made out of 100% Italian leather! The Le Corbusier Grande Comfort series was originalyl designed for the 1929 Salon d’Automne. Following the example of the LC1 Sling Chair, the LC2 Petite series reverse the standard structures of sofas and chairs by having frames externalized. It is a modern classic. The size for this chair is : 35″L x 29″D x 27″H; SH: 15″. All cushions are made of multi-density foam for plush comfort and firm support. Thick, resilient foam pillows rest on top of the frame and provide the kind of sumptuousness comfort found only in the finest overstuffed conventional chairs. The leather is hand-selected, expertly sewn and piped. All lines are clean, straight, and precise. This piece boasts incredible quality, style and comfort at an unbelievable price. Matching sofa and loveseat are available, too.